Street Fair is ALMOST HERE! 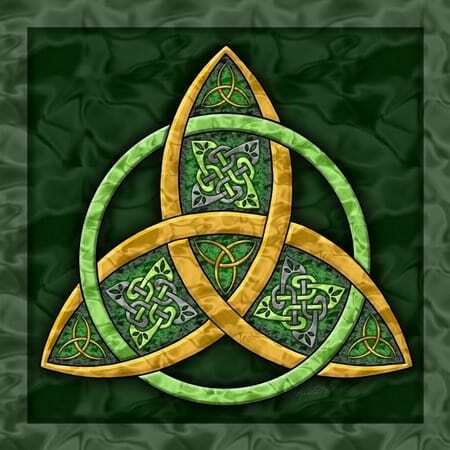 This Sunday, June 11, is Trinity Sunday. "A Divine Trinity? No Surprise!" Why would God be any simpler or less mysterious than the universe God has made? If you think "one in three and three in one" sounds unreasonable, consider the light itself, which manifests as either a wave or a particle, depending on the observer. Wave, particle and something mysterious which is neither: three in one! Not only that: it takes 8.5 minutes for a photon to travel from the Sun to the earth at the speed of light, but from the photon's perspective, the trip is timeless. The photon manifests in time and in timelessness! And God should be simple to understand? But we don't have to understand light perfectly to receive its life-giving power, nor can our minds fully grasp the multi-dimensional Love that flows from God the Source (Father), God the shaper and redeemer (Son), and God the life-energizer (Spirit). This is the life-force that flows through all things in time, but wells up from an inexhaustible Eternity. Sunday School Recognition and Family Church at 10 am: Our final Family Church of this season features a chance to recognize our devoted Sunday School Staff. Sunday School resumes on September 10. Today is also the last Wee Believers' service at 9 am in the Chapel. On Saturday, June 3, The Rev. David St. George, former Rector (1972-1991) traveled from Connecticut to officiate at the funeral of Charles "Chick" Conner, a life-long friend he had known from youth up. He spoke movingly of his faith in the resurrection. Our outreach fund is named in honor of him. The next day, on Sunday, June 4, The Rev. Stephanie Wethered and her family were on hand for the dedication of the window in honor of her ministry as Rector (2005-15). The church was filled with friends from the Diocese and parishioners. The window can be seen in the Vestry (Clergy Vestry Room) near the rear entrance to the church. A replica of the window on a Christmas ornament is now available for order. Proceeds will be divided between the parish and a purse for Mother Stephanie. This Sunday is our last Family Church of the program year :( It is going to be a great one, however, with our Junior SPY taking over! Come support them and enjoy what will be a special service. Also, come on the 11th to thank and support our wonderful teachers this year! We as a parish are so blessed to have these dedicated individuals among us and I am forever grateful to them!! Street Fair - June 9th & 10th! The St. Peter's Street Fair is this Friday and Saturday from 5:30-9:30. It is going to be FANTASTIC! We had so much help setting up! And almost everything is staffed ( still could REALLY use some help on Friday night if you are free). If you can lend us some time to help during the Fair, please let Dana Leach know ( scottdanaL@aol.com or 973-364-7544). Once it is all over we need to take it all down. Sad, isn't it? PLEASE all come to church on the 11th in your work clothes and stay afterwards to help with taking down and putting away the Fair until next year. It takes MANY hands to make it go quickly. Reach out to Ed Kamper if you can help ( ekpreservation@verizon.net or 973-228-3945). Thank you so much to those who have donated time, baskets, books, food... We can not express in words the extent of our gratitude to all!! Please join us for an evening of music on June 11, 2017 at 6:30 pm. Maia Schmidt, a young violinist from Caldwell, NJ, will be giving a solo recital alongside pianist Michael Wittenburg. She will be performing works by Franck, Schubert, Kroll, Vivaldi, and Saint-Saens. Maia has won prestigious awards such as American Protege and NLPA Showcase competitions. Last year, she had her New York City solo recital debut as a part of the 92Y Young Concert Artists Series and recently performed as soloist with the Washington Heights Chamber Orchestra. She plans to continue her musical studies in college at the Manhattan School of Music in the fall. Our Diocesan Bishop will be with us to preach, celebrate Communion, lead us in a renewal of our baptismal vows, and lead a Bishop's Forum during a special Coffee Hour in the Undercroft after the 10 am service. "What part do you feel you play in God's mission in the world? What are some of the ways you serve God's purposes?" The Vestry will then meet with the Bishop for lunch to discuss how we see St. Peter's serving God's purposes in our communities. We will hold HERO CENTRAL VBS on August 7-11! Thanks to those who came to our craft and decorating night last week. Our next volunteer opportunity is coming up in June! Join us Monday, June 19 at 7:30 in the Upper Room for a Craft & Decorating Night! Registration has opened and is filling up quickly! If you would like to have your child join us, please fill out the registration form and return it to the church office soon. Mutuality is at the heart of Christian practice, and the heart-beat of Saint Peter's is mutual support: some prepare the altar for the rest of us, others read so we may hear. Some take flowers to the sick and shut-in, others greet us warmly as we enter for worship. Church School teachers educate children from any family of the parish and OpShop Volunteers touch the lives of people in the larger community. Likewise, our after-service coffee hours are a kind of "rotating pot-luck" offering of members to members: each week a different family hosts the coffee hour for all who come. The rules are simple (and posted in the Upper Room): make the coffee (easy), bring some goodies (doesn't have to be fancy! ), and tidy up the space when finished. You are invited to "join the mutuality" by signing up for hosting one week this season. The sign up sheet is on the bulletin board in the Upper Room. Stay tuned for our Summer Sale Days!